The first youth ranking named after one of the main GDA Youth Sponsors enjoyed a very successful turn out. The event saw Craig Galliano and Jerome Duarte battle it out for an early lead in the overall rankings. 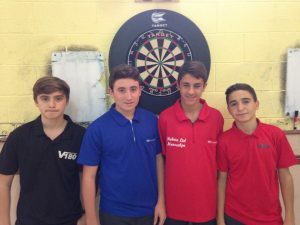 The top four, in the Rankings will determine the Gibraltar National Team selection for next year’s European Cup which will be held in Sweden. This competition saw a healthy turnout accompanied by a good standard of play by the youngsters, proving the Academy is heading in the right direction with its development program. This competition had four seeded players. With all managing to make it to the semi finals expect for Ethan Cleverly who had been knocked out by the upcoming Justin Hewitt who managed to cause an upset. Craig Galliano managed to scrape past Jerome Duarte 4-3 in the deciding leg. There was barely anything to separate both players in this event as they were both very evenly matched but it was Craig who held his nerve and came through with the win. Commiserations to Jerome Duarte, Congratulations to Craig Galliano!